He may be less than a week old, but little Beckett Josiah Thatcher already knows how to make a grand entrance. Just ask his parents Sarah and Caleb Thatcher. But as the Thatchers soon learned, life sometimes has its own plans. “Our friend told us about a birth mom that was looking for parents and so we said ‘Yeah,’ that we were interested Sarah said. The baby wasn’t due until September so the Thatchers started planning and hoping. Sarah said the process of adopting their first son took more than three years. While this time they were doing a private adoption through a lawyer, they were still ready for a wait. But just three days after submitting their profile to the birth mom, the phone rang. Caleb was also taken by surprise. “I was doing yard work and thought she was joking so I left all the leaves and threw the tools in the garage,” Caleb said. Ready or not, at 6 pounds 3 ounces little Beckett had arrived. 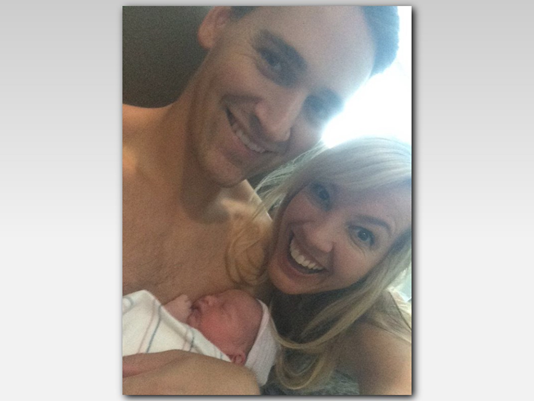 The couple raced to Mountain Vista Medical Center in Mesa to make the baby’s birth. “We’re just so grateful and a little shocked,” Sarah said. Complete joy with one little hiccup. The Thatchers didn’t have enough time to save the full adoption fee and needed $7,500 — fast. Once the online post went up, donations flooded in. “It was at 100 people and fully funded within the first 24 hours,” Caleb said. “It’s so wild, we were blown away by the support from friends and people we’ve never met before,” said Sarah. The outpouring, just another surprise the family can add to the story of how Beckett Josiah Thatcher came into this world. “One of the nurses here said, ‘This baby just fell out of heaven and right into your arms’, and we’re like ‘Yes he did,’” said Sarah. “Pretty much yeah,” Caleb added with a smile. The Thatchers did have a chance to meet with Beckett’s birth mom describing it as a very special and emotionally difficult moment. Beckett had some medical issues to deal with including some from being premature but the family is ready to do whatever they can to give him the best life.